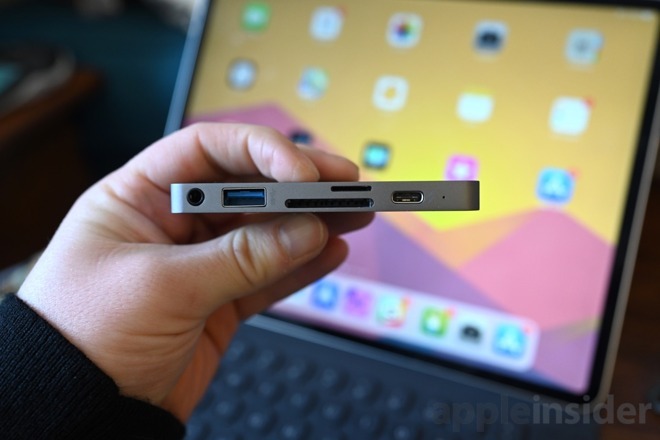 What you get appears on the surface very similar to ones from Satechi and others —an aluminum body with a single USB-C plug opposite a medley of other ports. Hyper's offering is a six-in-one, with a 3.5mm headphone jack, plus HDMI, USB-A, USB-C, SD, and microSD ports. 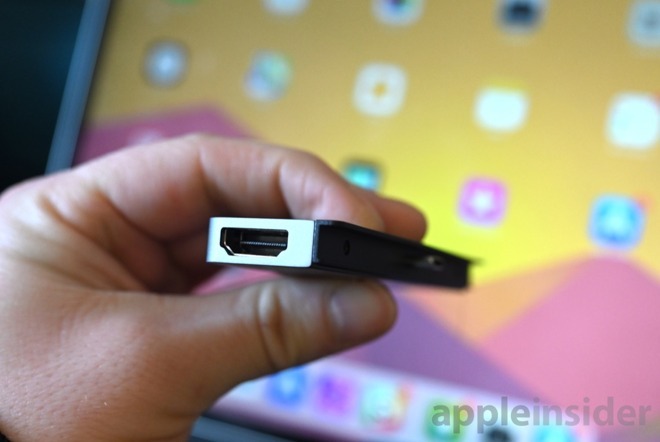 So far, that's the most we've seen on a dedicated iPad Pro USB-C hub. Within that list of ports are a few things worth touching on. 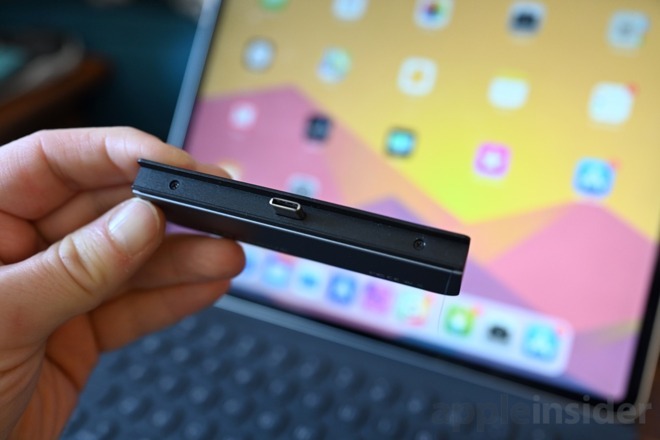 The USB-C port supports both Power Delivery as well as data, which means you can charge your iPad as well as utilize it for syncing and third-party accessories. If you are really looking for the best HDMI out, you aren't going to get it while using a hub. 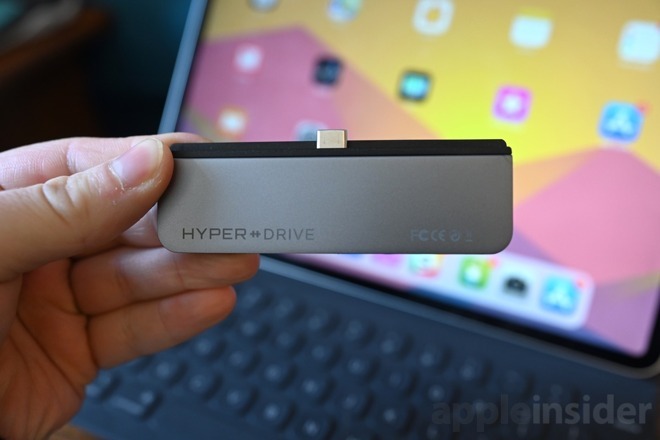 The HyperDrive supports 4K at 30Hz, but the iPad supports 4K at 60Hz. To drive 4K at 60Hz right now, it requires the full bandwidth of the port, thus, a hub won't work for that resolution. We've also seen hubs take over the audio — whether that is warranted or not. As an example, if you plug in an offending hub the iPad will see it as a possible audio device and routes audio through it, regardless if headphones are connected. HyperDrive doesn't do this and only reroutes audio when wired headphones are plugged into the hub. What sets HyperDrive apart from others the most, is the removable PVC clip. 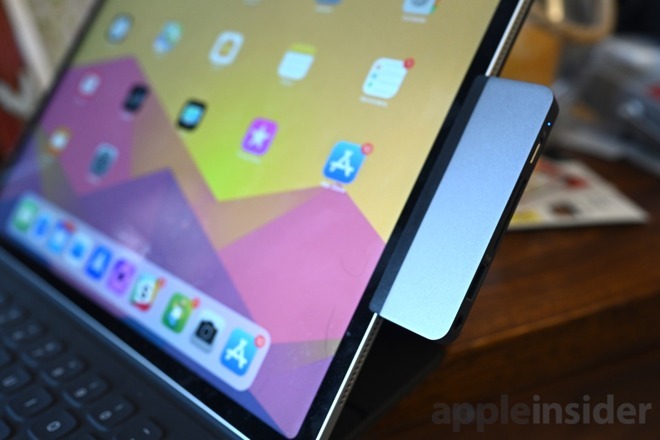 This slim accessory helps keep the HyperDrive hub stable and evenly distributes the weight across the entire edge of the iPad and not just the centrally located USB-C port. After testing many different iPad Pro hubs, this makes a huge difference. It easily stops the hub from disconnecting accidentally. This removable clip works with, or without, the Smart Keyboard Folio. If you have a case that it doesn't fit, remove the clip and you good to go. Is this for the real world? USB-C hubs are great for the new iPads, but practical applications are still somewhat limited by iOS. Having a USB-A port could theoretically be used for hard drives or flash drives, but iOS doesn't support external storage well. Copying over images through SD/micro SD is genuinely useful for anyone with an action cam or is a budding photographer, as the iPad Pro is an excellent editing device. HDMI on the iPad Pro is an effective way to watch movies or TV but otherwise is impractical. Only a few apps — including of those produced by Apple — have any real use case for an external monitor. I enjoy editing in iMovie and seeing my uncompressed raw footage show on a larger display. This all can change moving forward, especially with iOS 13 around the corner, but there is no guarantee that the functionality will be expanded. HyperDrive is being funded on Kickstarter like nearly all of Hyper's recent products. The campaign is just about to end, but shipping is set to commence by February. You can back the project and get HyperDrive for $69. This is a Kickstarter crowdfunding campaign so there never is any guarantee that the product will ship, but we've at least tried it out and the company has an excellent track record for previous campaigns.